Dimensions 0.50 by 4.25 by 6.75 in. Amazon.com description: Product Description: Robert Louis Stevensonâs rousing seafaring classic. For sheer storytelling delight and pure adventure, Treasure Island has never been surpassed. 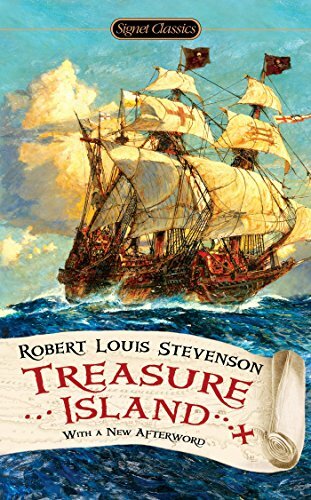 From young Jim Hawkinsâs first encounter with the sinister beggar Pew to the climactic battle with the most memorable villain in literature, Long John Silver, this novel has fired readersâ imaginations for generations. A rousing tale of treachery, greed, and daring, Treasure Island continues to enthrall readers of all ages.